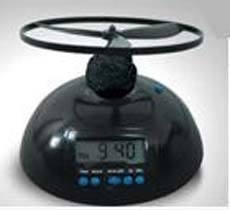 Few days back we brought you the Blender Alarm Clock but if you still have hard time to get up in the morning you may want to try this Flying Alarm Clock. When the alarm goes of in the morning, the propeller starts to spin and takes off into the air and lands somewhere in your bedroom. Siren alarm continues until you place the propeller part back into the top of the alarm clock.